Koh Phi Phi Beach Resort refers to 2 ideas. The Phi Phi The Beach Resort on Long Beach and Beach resorts on Koh Phi Phi. This article shares information about both of these subjects and directs you to further links that will go into further detail. Koh Phi Phi Beach Resort, refers to Phi Phi The Beach Resort on Long beach. The resort is the most easterly resort on Long Beach and the Deluxe Grand Seaview cottages get the best resort sunsets on the greater Tonsai Bay. Phi Phi The Beach Resort sits a top the famous Shark Point and enjoys some of the best reefs and coral gardens on Phi Phi Don. Shark point safe turning point for the ferries from Krabi and Koh Lanta as 3 large rocks breaks the surface here. The reef is dominated by large coral structures on the west side of these rocks which in turn are covered by shoals of tropical fish and marine life. On the east side of these rocks broken stag head coral (broken coral collects here from the monsoon storms provides the perfect hunting ground for the resplendent yet harmless black tip reef shark. The best reviewed Koh Phi Phi Beach Resorts are the Zeavola Phi Phi Resort, the Holiday Inn Phi Phi Island and the Phi Phi Island Village Resort And Spa. These resorts in the quieter north of Koh Phi Phi are beachfront and have that elegant getaway style that distinguishes them form all other resorts. These beachfront Resort have excellent dining, in house diving and relaxing spas to take away the troubles of the world. 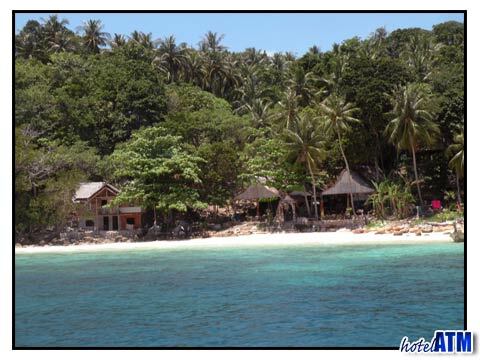 The palm covered Laem Tong and Loh Bagao beaches are a wonderful setting for a luxury holiday in Paradise. On the east coast the resorts look out onto Bamboo Island, Koh Lanta and Krabi Coastline in the distance. It's worth remembering if you are a full moon lover that these eastern locations will see a rising moon every month. Phi Phi Hill Resort and the Phi Phi Relax Beach offer something unique and are to be recommended. 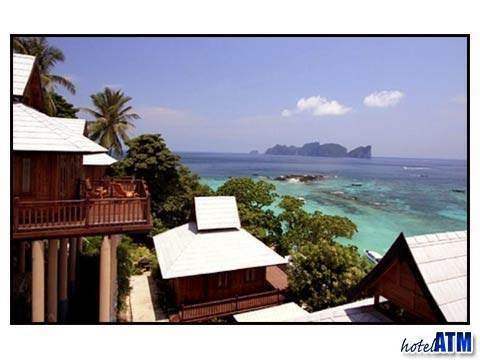 Phi Phi Hill Resort has very simple, almost old fashion bungalows with a stunning view of Phi Phi Ley and Long Beach and with an excellent price tag. From 750 THB (Yr 2012) a night it makes Phi Phi affordable for the week. Phi Phi Relax Beach Resort is on a beach of it's own and runs some quirky bungalows down on the beach under the mountain and on top of a coral reef. These are probably the islands most remote resort bungalows on the beach. Whatever you are doing on Koh Phi Phi the Koh Phi Phi Beach Resorts are a must if you want to experience the best of life on the islands.